I have fine but frizzy looking hair with a little bit of wave naturally. I have conditioned and sought all kinds of treatment products hoping to finally one day have my hair lay nicely and look good. I have seen all the hype about the brush straighteners but was afraid to try them for a couple different reason : 1) I am somewhat clumsy and just knew I would burn my head or ears 2) I was afraid that my fine hair would look paper thin if I straightened it. I was wrong on both counts. Beautonics Advanced Hair Brush Straightener has an anti-scald feature that keeps all of us clumsy people safe from ourselves. Believe me when I used it I touched my scalp and ears several times and no burns. The little anti-scald balls on the ends of the heating elements keep me safe. It was easy to use, just allow it a few minutes to heat to the desired temperature. There is an LED display for easy temperature reading. You can adjust the temperature from 180* C - 230* C. I used it pretty much like a regular hair brush just moved it slowly through my hair. I have found that if I come up from underneath a section of hair and lift up and out as I brush through it I get a little more volume as well as straight hair. No more frizziness, just healthy looking , shiny sleek straight hair. YAY!! 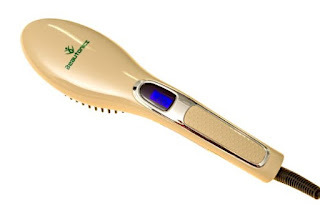 I don't know if you remember, but you wrote a blog review for us a little while back about our Beautonics Hair Brush Straightener. I just simply wanted to ask if you would be able to change the link from your review from the Amazon one to our new link as that is where it is sold now and would help our site tremendously. Thank you so much and we hope you are doing very well, we will also definitely keep you in mind for any future products.